Fancy getting out from behind the computer and meeting some of Australia's coolest art, design and craft bloggers for real? For all you Brisbane arty/crafty/designer types, the next Spring 2010 Brisbane ABCD meetup is coming your way on Thursday 23rd September, 2010 from 7–9pm. Join host Kim Wallace from Udessi and fellow creatives at Bar Alto at the Powerhouse in New Farm which has great parking, easy access to the bar, bar food, coffee and tea that you can order throughout the evening. 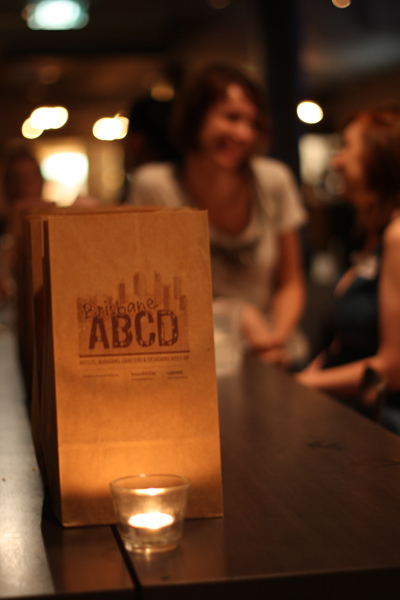 Don't forget to take along something for the much-in-demand ABCD Goodie Bag. It's entirely optional, but if you like, you can take along something to remember you by to pop in to approx. 30-40 bags which will be distributed at the event. And as added incentive, participants will be able to vote for their favourite goodie bag item after the event, and the winner will receive one FREE month of advertising on Bondville, with the 2 runner-ups receiving a special little gift from Udessi! We will post any upcoming meetups here and you will be able to RSVP via Facebook. Photos of the night will also be uploaded here. B. Join our new mailing list. For those of you that aren’t on Facebook we have created a new mailing list. You can choose if you would like to receive news about the Brisbane or Sydney meetups. Due to the great response we’ve had since the last meeting and limited venue capacity, please ensure to RSVP either through Facebook or by emailing Kim at BrisbaneABCD@gmail.com. This will be the first ABCD meetup that I won't be able to attend as we have moved to Sydney, but here's the good news... keep an eye on Bondville for info on a Sydney ABCD Meetup! Would you be interested in attending and meeting other art, craft and design bloggers in Sydney? If so, please join our Facebook page, or mailing list above. For more information about ABCD, check out our Facebook page, or the ABCD page here on Bondville. Have a great time - I look forward to lots of photos! Oh Yipppeeee! I was so sad that I missed the last one! I'll make sure I'm at this one!